Bob Marley is an awesome artists who influences culture, religion, and politics. With all the movies based on lives of famous musicians, why not make one featuring Bob Marley. A movie on Bob Marley’s life story would have comedy, drug references, drama, and a great soundtrack, all a must for a instant classic. But who could play such a heavy role? Well many producers and internet fans believe James Franco is the Perfect choice. But wait, isn’t James Franco a white boy? It is true Bob Marley is a racial mix of a white Essex father and a Jamaican mother. However at the time most of the world considered Bob Marley to be black, and influenced African Americans and European Americans alike. But in today’s time people can look over such facts in movies. Nick Fury is black, and Robert Downy Jr got to live every suburban white boys dream, actually look black and also play Iron Man. 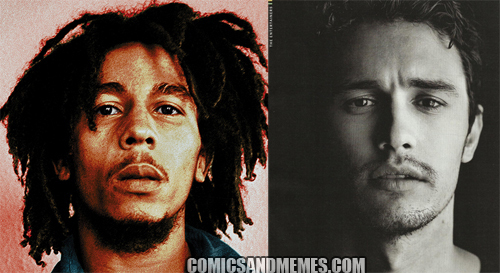 James Franco would also be a good bet to play Bob Marley because of his pro marijuana actions. He has admitted smoking, starred as a stoner in many movies, and hangs around people associated with smoking the reefer. Also James Franco has an underlining intelligence and politeness to him, also like Bob Marley. So, lets get this movie made!